Don’t forget — you are more than just a farmer. 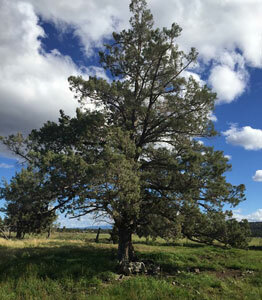 This tree was my late father's thinking spot on our family dairy farm in Bend, Ore. I recently tuned in to the NFL football game of the Chicago Bears versus the Philadelphia Eagles. Just like millions of people across the globe, we watched the nail biter game that came down to a missed field goal by the Bears’ kicker, Cody Parkey. I watched the postgame interview, and I was so impressed with Parkey's poise and demeanor. One statement he made really stood out. He said, “Football is what I do. It's not who I am." I think we all have a lot to learn from Parkey. Dairy farming is what we do; it is not who we are. This might be hard to comprehend because dairy farming is our livelihood, so it becomes a part of who we are and really a part of our identity. However, I really suggest looking deep in the mirror and learning more about yourself and who you really are. I think many people don't realize that they are more than "just a dairy farmer" until the cows are gone and they are forced to reevaluate their purpose. I know this was true for my father. My parents’ cows left through the CWT (Cooperatives Working Together) program in 2005. My family and I were thankful for this opportunity for my parents to exit the dairy business, which happened three years before my father had a massive stroke. We honestly felt like he would milk cows until he died, and we are thankful he did not. My parents’ retirement differed from most. They didn't vacation, although my father was able to come visit me in Illinois after the cows were gone and my mother had passed. My father put a lot of thought into his retirement leading up to the decision to sell his herd. He knew he would need a reason to get out of bed each morning, and having some livestock around would help him do just that. So, he had a small sheep and beef herd after the dairy cows left. He would go outside to feed the animals, haul manure (yes, that still needed to be done), irrigate the pastures, and find his thinking spot. That is something he really enjoyed doing. He’d drive his John Deere tractor to the back 60 acres, put it in park, and then get out his packed lunch. He’d sit on a fallen tree log, overlooking the farm he and my mother purchased in the late 1970s. This was his thinking spot. He enjoyed recalling all the memories of raising cows and kids that were made on our family dairy farm. My father worked hard not to lose his purpose after the cows were gone. Dairy farming is what he loved to do for nearly four decades, but ultimately he was so much more than just a dairy farmer. He was well-read and followed the stock market. He was a sports enthusiast and an animal lover. Dad was able to laugh and smile more than not. He was a Marine and a college graduate. He was a husband, a father, a brother, and a friend to so many. My dad enjoyed being outdoors with the fresh air on his shoulders, and he loved making a small farm thrive because of his deep-rooted passion and hard work. When the cows left, he was still able to smile big because he was more than just a dairy farmer. He raised livestock and a family, and really, the later is what he was the most proud of. He made a good life milking cows, but ultimately, dairy farming was simply his profession. He was so much more than "just a dairy farmer."